LINUS 2.0 Saringan Bahasa Inggeris for Year 1 is to be implemented very soon with the Saringan Membaca kickstarting from 13th May 2013. English teachers from Year 1 are expected to be called for briefing now or soon for this new saringan LINUS Bahasa Inggeris, an add on to the existing LINUS BM dan LINUS Mathematics. 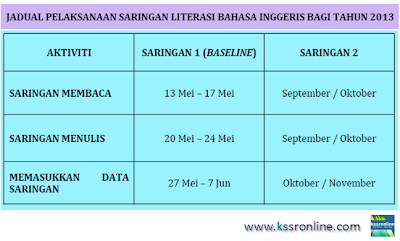 1) Saringan 1 (Baseline) and Saringan 2 for Year 1 , 2013. 2) Saringan 3 dan Saringan 4 for Year 2 , 2014. 3) Saringan 5 dan Saringan 6 for Year 3, 2015. For more detail, please find the manual by clicking the link below.